FSU v Miami Kickoff at 2AM ! After our long day at the Louvre and walking up Champs Elysees to Arc de Triomphe, we stopped by Beer Academy for a refreshing drink. This time I went for a dark: Westmalle Dark. Compared to the Guinness (Beer #1), this did not have the strong bitter aftertaste. It was noticably drier and more bitter than the blondes and ambers I've been drinking but still smooth. I could do this again. 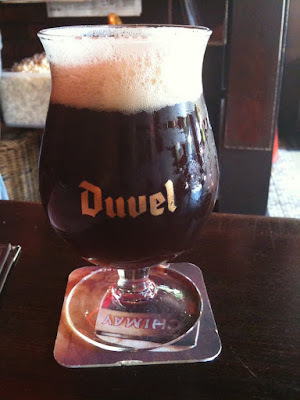 Unfortunately, they must not have Westmalle glasses so they served it in a generic Duvel glass.